Dr. Divya Borthakur, a doctor serving for Coal India, was injured as her car was attacked by bandh supporters at Digboi Golai area of Tinsukia during the 12-hour Assam bandh called by Tai-Ahom Yuva Parishad Asom (TAYPA) demanding ST status for the community and scrapping of the Citizenship (Amendment) Bill, 2016. Dr. Borthakur is an eye specialist at Coal India hospital in Margherita. “Dr. Borthakur received injury when her car was attacked by bandh supporters near Digboi’s Golai area,” said sources. According to information, after dropping her husband at Digboi Civil hospital, Dr Borthakur was returning to Margherita with her Swift Dezire (AS 06-Q-5636). 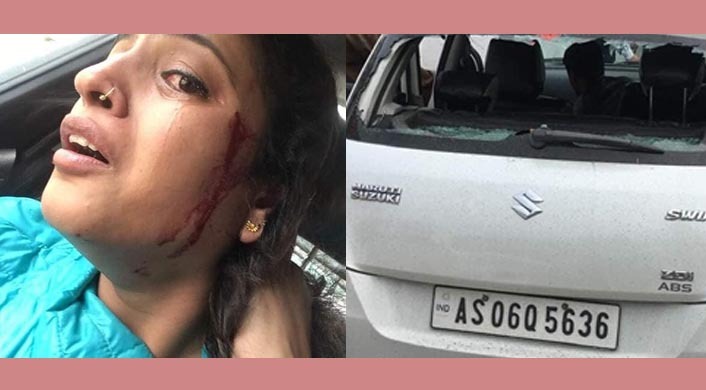 But suddenly bandh supporters attacked her car in which she was injured. The 12-hour bandh called by TAYPA paralysed normal life in upper Assam and incidents of violence have been reported from various places. The bandh supporters also burnt tyres in various parts of upper Assam. Meanwhile, Dr Borthakur has lodged an FIR at Digboi Police Station. Speaking to Northeast Now, Officer-in-charge of Digboi Police Station, Mahesh Bora said a case has been registered at Digboi Police Station. “We are finding the miscreants and as per law we will take action against them,” he said. “The government should take strict action against the bandh supporters. Who have not given them (protestors) the right to attack and vandalise someone’s property during bandh. I have urged the Tinsukia district administration to take the matter seriously and take necessary action against the miscreants,” Manab Das, a resident of Tinsukia said.